all for the initial blocking deposit. The Catalunya Express Hotel is an attractive hotel for a wide public's variety. It has 30 hospitable rooms equipped with television, air conditioning, telephone and a bathroom with a shower, including a washing basin and a hair dryer. 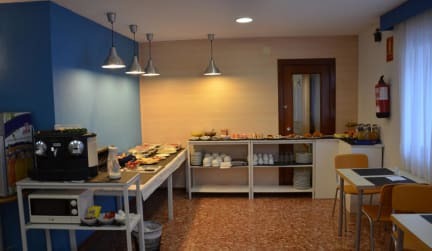 As common interest zones the Catalunya Express Hotel offers a social lounge with television and internet access. As well the Catalunya Express Hotel offers a self-service laundry room, where you can do your washing in case you need it. After a short break, nothing beats our exquisite and full continental breakfast buffet each morning is served from 7:00 am to 11:30 am hurry to sleep until the last second. Our restaurant exclusively for guests of the Hotel is family friendly . Nicely decorated to provide peace and relaxation. The food we provide is of Mediterranean character with a menu that is prepared daily to provide the highest quality products in our market. The mix of fish and meat Costa Daurada inside our plates make the perfect combination for the palate.